The global glue-applied labels market is forecasted to largely benefit from the rising adoption of small-sized polyethylene terephthalate (PET) bottles used for toiletries, cosmetics, and carbonated soft drinks. The increasing demand for highly durable and readily available labels is predicted to support the growth of new innovations in the market. Besides shrink sleeves, complex films could be extensively used for labeling purposes in the coming years. Avery Dennison already introduced its curvy film technology to apply labels on curved and extremely complex container shapes. 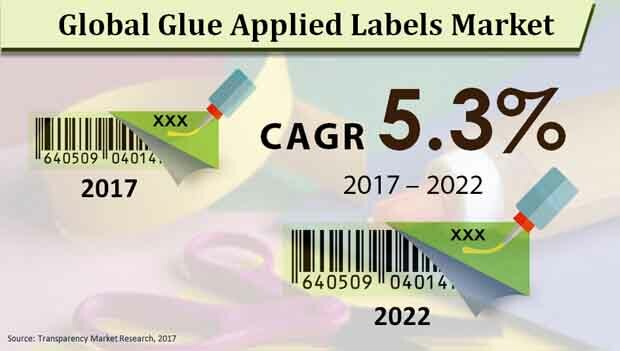 The global glue-applied labels market is envisioned to attract a revenue earning of US$25.3 bn by the completion of 2022 after progressing from a US$19.6 bn achieved in 2017. It is estimated that the market could rise at a 5.3% CAGR. The international glue-applied labels market is foreseen to draw a whole lot of demand from the strengthening trend of esthetically-appealing offerings among consumers. As a result, food and consumer packaged product manufactures could be compelled to focus on visually appealing labels and ease of use packages. Moreover, manufacturers are expected to make constant innovations in labeling solutions by providing customized solutions or designing attractive labels. The international glue-applied labels market is projected to be cataloged into three categories, i.e. face stock material, type of layer, and application sector. In respect of face stock material, paper could exhibit a colossal share in the market while growing at a CAGR of 4.8%. Other segments such as polypropylene, polyethylene, and PET could also contribute toward the growth of the market under the face stock material category. In terms of layer, there could be two segments, viz. laminated and non-laminated. On the basis of application, the international glue-applied labels market could be segregated into food and beverage, pharmaceutical, tracking, logistics, and transportation, home and personal care, semiconductor and electronics, retail labels, and other products. Regionally, the international glue-applied labels market is predicted to testify the ascendancy of Asia Pacific except Japan (APEJ), which could rake in a US$9.6 bn by the end of 2022. A high demand for packaging and labeling in China and India could augur well for the APEJ market. Japan and the Middle East and Africa (MEA) are prognosticated to gather a slow pace of growth during the forecast period. However, there could be faster growing prospects available in North America and Europe, which are envisaged to be among the lucrative markets other than APEJ. The report offers a complete evaluation of the competitive scenario of the worldwide glue-applied labels market in both the present and future forecast years. The analysts profile some of the leading players of the market such as Avery Dennison Corporation, Coveris Holdings S.A., CCL Label, Inc., Constantia Flexibles Group GmbH, Henkel, Lintec, Inland Labels, 3M, and WS Packaging Group, Inc. The competition in the market could intensify on the back of price wars caused due to the availability of innovative solutions at lower prices offered by local players compared to those of global companies.